YORKTOWN, VIRGINIA October 19, 1781 - In a stunning reversal of fortune that may signal the end of fighting in the American colonies, Charles Lord Cornwallis today signed orders surrendering his British Army to a combined French and American force outside the Virginia tobacco port of Yorktown. Cornwallis' second-in-command, Charles O'Hara, attempted to deliver Cornwallis's sword to French general, Comte de Rochambeau. But Rochambeau directed O'Hara to American General George Washington, who coolly steered the British officer to Washington's own second in command, Major General Benjamin Lincoln. Thus ended a three-week old siege which had begun with the miraculous convergence of French and American forces on the Chesapeake Bay. With just a brief window of opportunity to pin Cornwallis in Virginia, Washington and Rochambeau raced southward from New York to link up with the French fleet under Admiral Comte de Grasse in Chesapeake Bay. They arrived just in time to corner the British, who were anticipating relief that never came from either General Henry Clinton or the British fleet. Off shore, the French fleet effectively blocked aid from Cornwallis. On shore, the incessant shelling of the French and American guns made life miserable for the British troops. When a British officer finally appeared with a white flag on the parapet surrounding Yorktown, the French and American guns fell quiet. The Continental forces let go a momentous cheer until Washington ordered it silenced. "Let history huzzah for you," he was heard to shout. 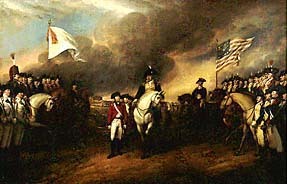 Cornwallis' surrender ended a disastrous southern campaign for the British army. Britain's strategy—an attempt to incorporate loyalist support with British efforts—had begun with high hopes and a victory in Charleston, South Carolina just a year and a half before. But the plan backfired as loyalist and Patriot forces in the south fought a series of savage fights that left both sides bloodied, but only the Patriots unbowed. Cornwallis limped into Virginia in late summer trailed by a force led by the The Marquis de Lafayette, long a supporter of American efforts both as a soldier in this country, and as an advocate for the cause in France. As Cornwallis' 8,000 man force became prisoners-of-war, the British band played the The World Turned Upside Down, a tune that underscored the strange turn of events which had brought defeat at the hands of the provincial forces of America, to the most powerful country in Europe. As the "world war" engendered by the American Revolution continues to plague British foreign policy, it looks more and more likely that King George and Parliament will cut its losses in the colonies and begin a withdrawal of troops. After six and half years of fighting, the war may be finally over.